Design Justice advocates for the dismantling of the privilege and power structures that use the design profession to maintain systems of injustice. It requires the profession to design for the dis-empowered, the oppressed and the disinherited who bear the brunt of the injustice in our built environment. 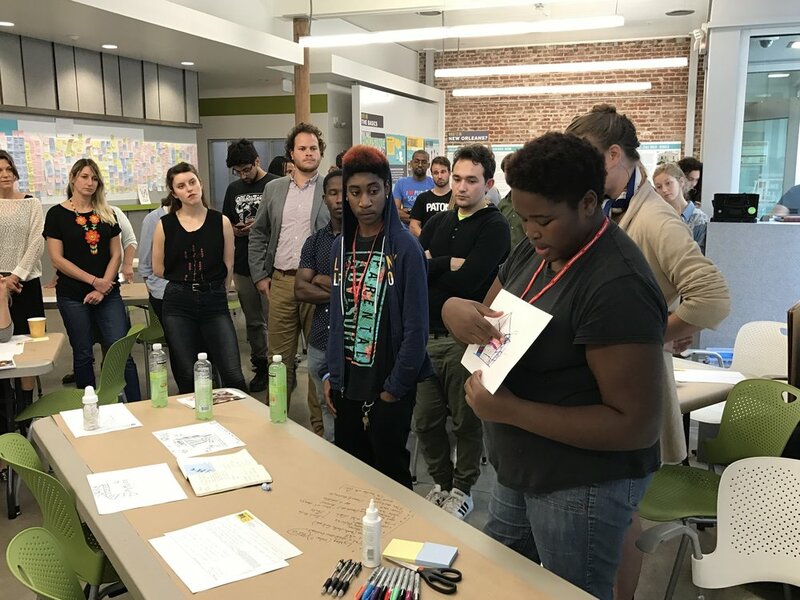 In addition to local projects, Colloqate works for Design Justice by gathering together designers from across the country to talk about how we can ground our work in equity, and build for a better future. The Design Justice Summit is a Design Advocates Gathering, in partnership with the AIA, bringing together twenty-four social impact architects and designers from across the country with the explicit intention of sharing knowledge and workshopping to address the intransigent issues of injustice facing communities throughout the world. Our mission is to codify and grow a diverse community of public interest design leaders with the capacity to shape the future of the profession towards equity. We hope to inspire and challenge these leaders to take the knowledge learned throughout the summit and return to their respective communities to innovate and implement. DESIGN AS JUSTICE (DAP) advocates for the dismantling of the privilege and power structures that use the design profession to maintain systems of injustice. It requires the profession to design for the dis-empowered, the oppressed and the disinherited who bear the brunt of the injustice in our built environment. The DESIGN JUSTICE PLATFORM (DJP) is a living document developed to establish a socially and environmentally just code of ethics for operating as designers of the built environment. Through this platform, we acknowledge our role and responsibility in creating spaces of racial, cultural, and class equity. Through this platform we will organize, advocate, develop, and act to foster on a principled movement for a socially just profession. What does design justice means to you? The DAP is the organized action of the DJP in a series of workshops encompassing activism and design, advocating for social justice in the built environment. The base impetus for the workshops is to put into play the difficult conversations that define the injustices of our society. Ideas that are rendered and generated will be put into a public dialogue through new intervention models, such as billlboards, wheatpaste posters, and yard signs, but in addition, the concepts will be added to a visual compendium of ideas for activists, designers, and artists. The Design Justice League is a design and equity recreational league. Put together to series a social Justice gatherings designed to bring together community members, artist, activists, and designers in pursuit of justice in the built environment. The League provides a weekly opportunity for discussion and a framework for people to connect around our collective design challenges. What issue are you passionate about/ believe the design profession should address? How does design of the built environment amplify or exacerbate the issue? How does design play its role in achieving justice relative to this issue? a list of Books, People, Programs, Projects, addressing this issue. Interest Level Just Curious... Absolutely! Lets dismantle the system! Thank you for joining the movement! We will keep you posted as we move towards the January 20th, 2017 Day of Action.